Click on banner to return to homepage. All costumes patterned and cut by B. Marx. Sack back gown and petticoat with reverse pleated trim for Elmire in Tartuffe. Period coat, and stock for Valere. Gown and stomacher for Mariane. 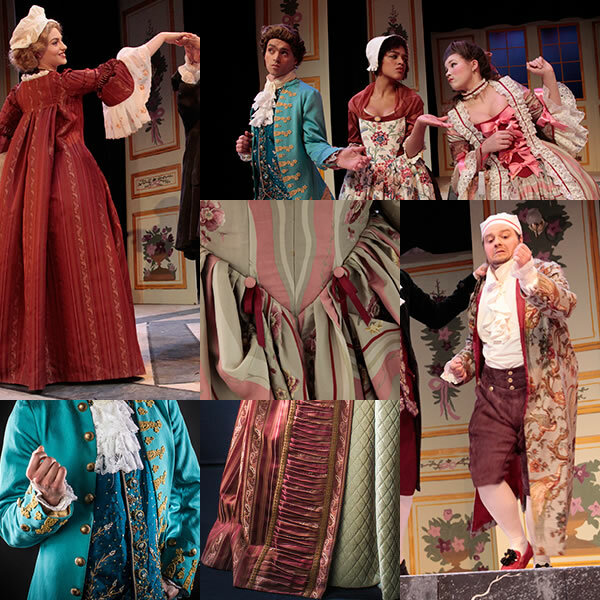 Bodice, apron and skirt for Dorine, all from Tartuffe. Dorine Bodice construted by Stephanie Sandburg. Banyan robe for Tartuffe from Tartuffe. Gown for Madame Pernelle, breeches for various characters, waistcoat for Orgon, bodice for Flipote. 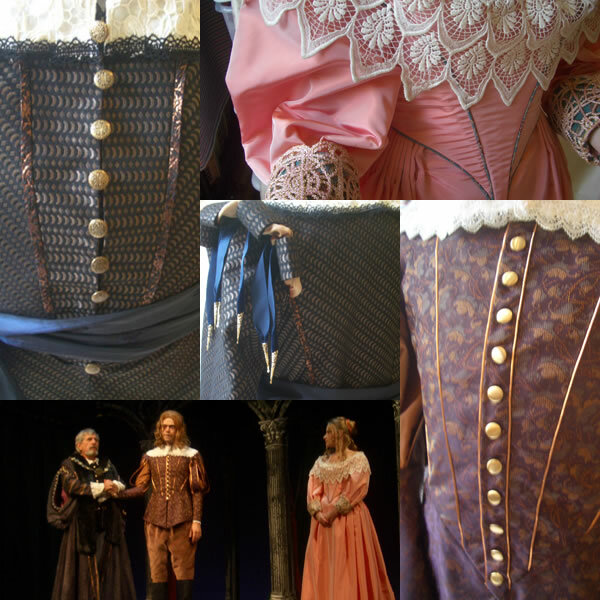 Surcoat and gown for Anne and leather armor for Richmond in Richard III., 2013. 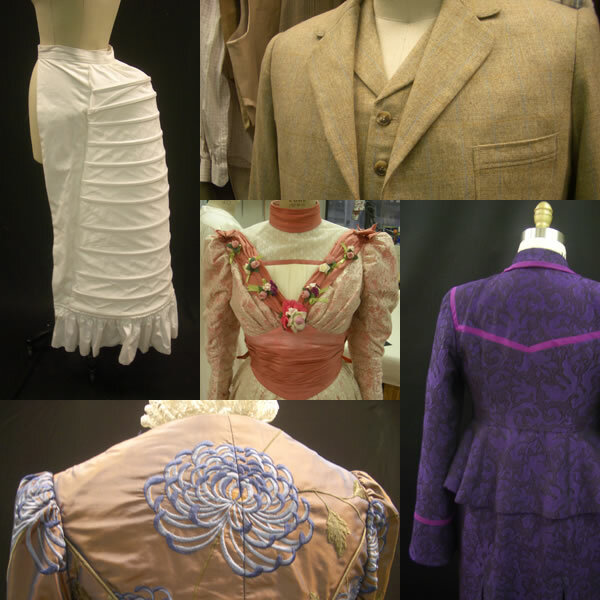 Waistcoats for Salerio, Lorenzo and Gratiano and white dresses for Nerissa and Portia in The Merchant of Venice, 2012. Black and white coat for Oberon and red satin dress for Titania in A Midsummer Night's Dream, 2013. Doublet for Claudius in Hamlet. Front and sleeve cap detail. Patterned, cut and built by B. Marx. Dress for Ophelia in Hamlet. Front bodice detail and production photo. Patterned and cut by B. Marx. Bodice built by B. Marx. Sleeves built by C. Connor. Skirt built by various staff. Doublet for Laertes in Hamlet. Front detail and production photo. Patterned, cut and built by B. Marx. Leather doublet for Hamlet, doublets for Rosencrantz and Horatio, dress for Gertrude, various breeches, Roman tunics and dresses for A Comedy of Errors. Dress for Valentina in The Bay at Nice. Patterned, cut and built by B. Marx. Costumes for Vinegar Tom. From left to right: dress for Betty, bodice for Margery, coat for Jack, bodice for Goody. Patterned and cut by B. Marx. Built by B. Marx and J. Mosier. 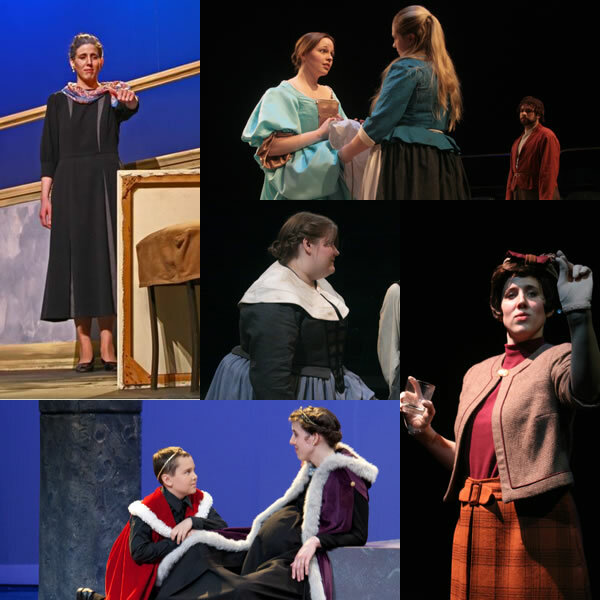 Capes and pregnancy dress for Hermione and Mamillius in The Winter's Tale. Draped, cut and built by B. Marx with A. Wattum. Jacket for Mother in How I Learned to Drive. Patterned, cut and built by B. Marx. Dress and bustle cage for Irene in The Adventures of Sherlock Holmes. Bodice back detail. Patterned by G. Clark. Cut and built by B. Marx. Suit for Atticus Finch in To Kill a Mockingbird. Vest/Jacket front detail. Patterned by L. Vandermuelen. Cut by B. Marx. Built by L. Vandermuelen and B. Marx. Dress for The Ladies' Man. Bodice front detail. Patterned by G. Clark. Cut and built by B. Marx. Suit for Crowns. Suit back detail. Patterned by G. Clark. Cut and built by B. Marx. Virginia Shakespeare Festival, Williamsburg, VA. Cutter/Draper Summer 2011, 2013. Assistant Costume Designer Summer 2011. University of Alaska, Fairbanks, AK. 2009 to present. Cutter/Draper, Costume Designer. Indiana Repertory Theatre, Indianapolis, IN. 2007-2009. First Hand. 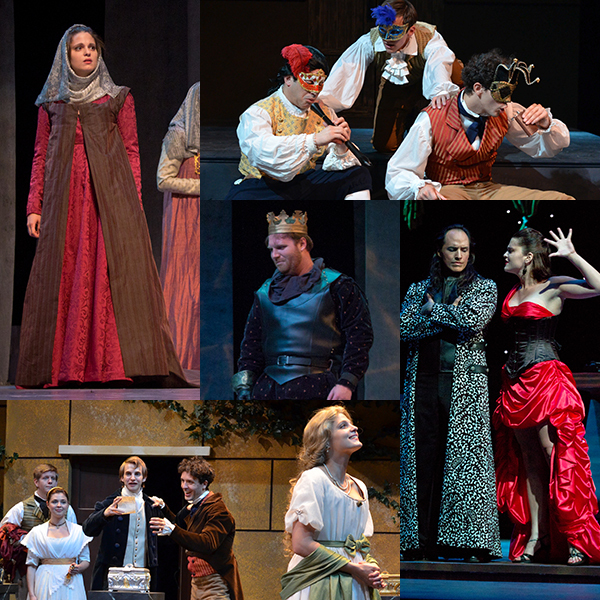 Texas Shakespeare Festival, Kilgore, TX. Summer 2008. First Hand, Dyer. University of Massachusetts, Amherst, MA. 2004-2007. Shop Assistant, T.A., Dyer/Craftsperson, Wardrobe and Makeup Supervisor. Pioneer Valley Summer Theater, Easthampton, MA. Summer 2005. Wardrobe Supervisor. Utah Shakespearean Festival, Summer 2003, 2004. Stitcher, Wardrobe Supervisor.